The Baldiri Aparthotel (3*), is a cozy and familiar aparthotel where the guest can stay both short or long therm, depending on its needs. It has been inaugurated in January 2017 in order to please them. We are situated in a quiet area of the city. We also have very close all services such as supermarket, shopping centers, pharmacy among others. 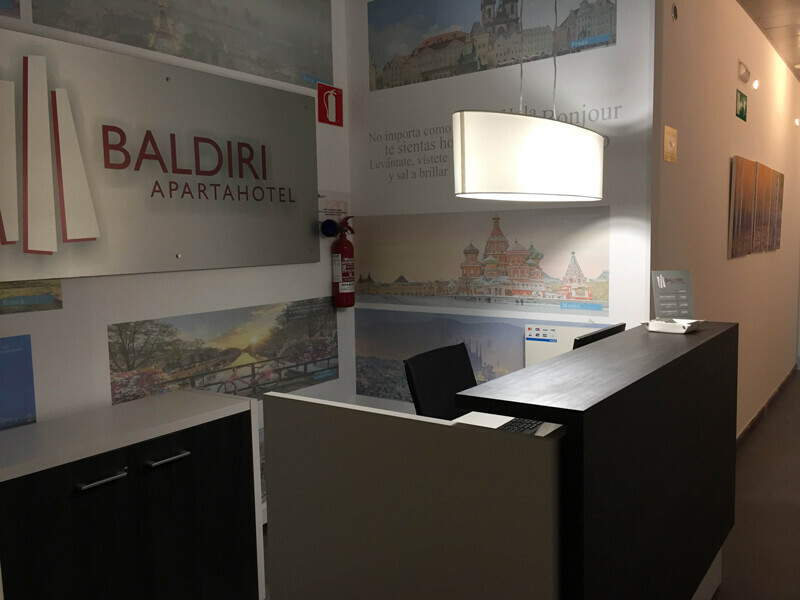 The Baldiri Aparthotel is located very near from Barcelona, exactly 8 km and 10 minutes by car. The Barcelona airport (El Prat) is only 3 kilometers from our aparthotel. As to public transport, in the area there are many buses and the train that will take you to different places of Barcelona. For example, you can go to the Fira of Barcelona in a direct trip only taking the train situated in the train station of Sant Boi. Our place has 11 apartments with more than 25 square meters. Every apartment is different, but all our apartments are fully equipped. Especially, we have a star apartment which consists of a large living room with kitchen, a private bathroom and also a double bed with a big jacuzzi so the guest can relax before sleeping. A kitchen with refrigerator, microwave, electric plate, household and crockery. Living room with extendable table, chairs, a confortable sofa and television. And a double bed of 1,50 mts with closet. Wifi, air conditioning, heating, telephone in each apartment, cleaning services and charge of towels and sheets. Individual alarm in each apartment. Pets are not allowed, except in cases permitted by law.